My bee mentor (you need a bee mentor) comes to show me how to get the queen and her court into the hive. That works, then I am to feed them sugar water and hope for the best. First year goes well, Adelina lays lots of eggs, and bees make lots of honey which you shouldn’t harvest the first year because the hive will need it to get through the winter. I worry a bit during the winter, give them winter food like I am told and they make it! Feeling pretty sassy I decide to get another queen to start the second hive (named her Beatrice.) Again things go along pretty well, I spring feed them as instructed but where I really fail is checking the hive. At least every month a good beekeeper dons his/her bee gear, smokes the hive with dandy little smoker and opens up the hive. Your mission is to check to see the queen and check to see if she is laying eggs. I have never seen the queen but I know she is laying eggs or someone is. One also checks to see if there is honey, what the cells look like and just general health of the bees. Well, the bees really don’t appreciate your concern for their health, “get out of my hive!” And these bee hives/boxes that you must move are HEAVY! When full of honey they are at least 40-50 pounds. As much as I hate to admit it, I’m not that strong. So needless to say, I didn’t check as much as I should. Yep, I lost one hive, Beatrice, to wax moths. I cried out to my beekeeping friends (local beekeeping clubs are wonderful) and they encouraged me to not quit and they would help, even Chuck volunteered! Mentors came help me check the hives, which somehow survived in spite of me. We bought an extractor and tried again. Success, bottling about 56 jars of honey! But this time we were in an enclosed workshop, used a blower to get the bees off and settled into a day long process. 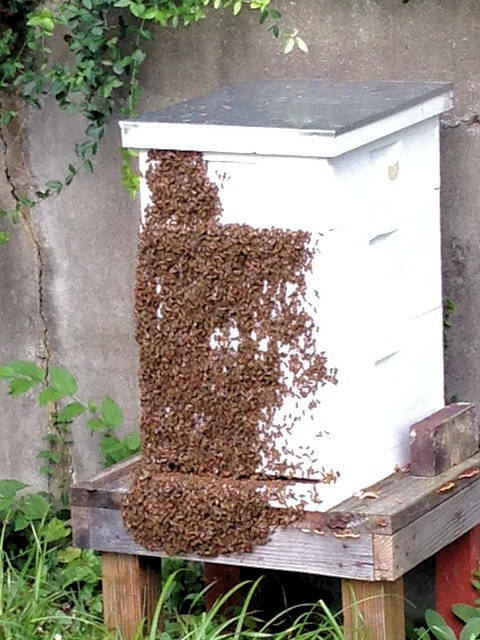 Beekeeping is hard and don’t hesitate to ask for help. Beekeepers are real nice people and want to help but there are lots of opinions and ways to do things. Respect the bees, they work hard making that honey and surviving, don’t take it lightly. Bees are amazing creatures and beekeeping is a rewarding hobby, not just for the honey, but for the insight into one part of nature’s organization and its will to survive. I’d love to hear your bee stories or any advice you might have for me. 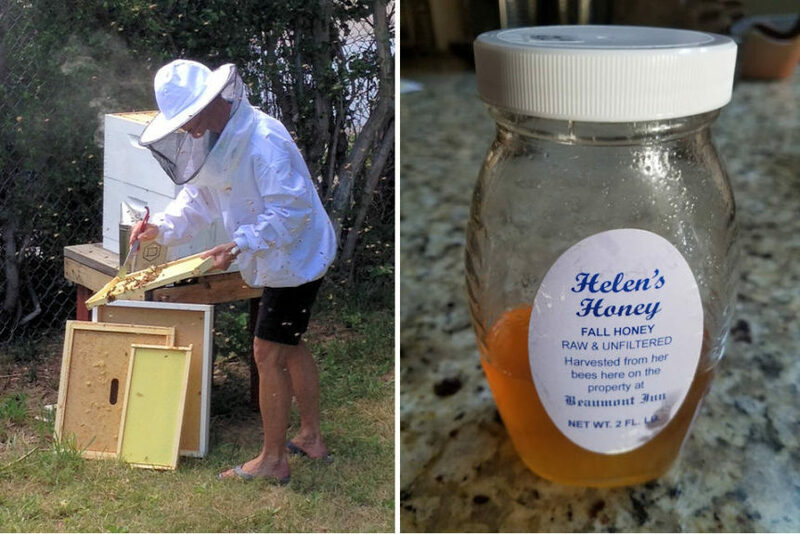 I have often heard beekeepers that have been doing this for years call themselves beginners. Life is learning! Bee Happy.